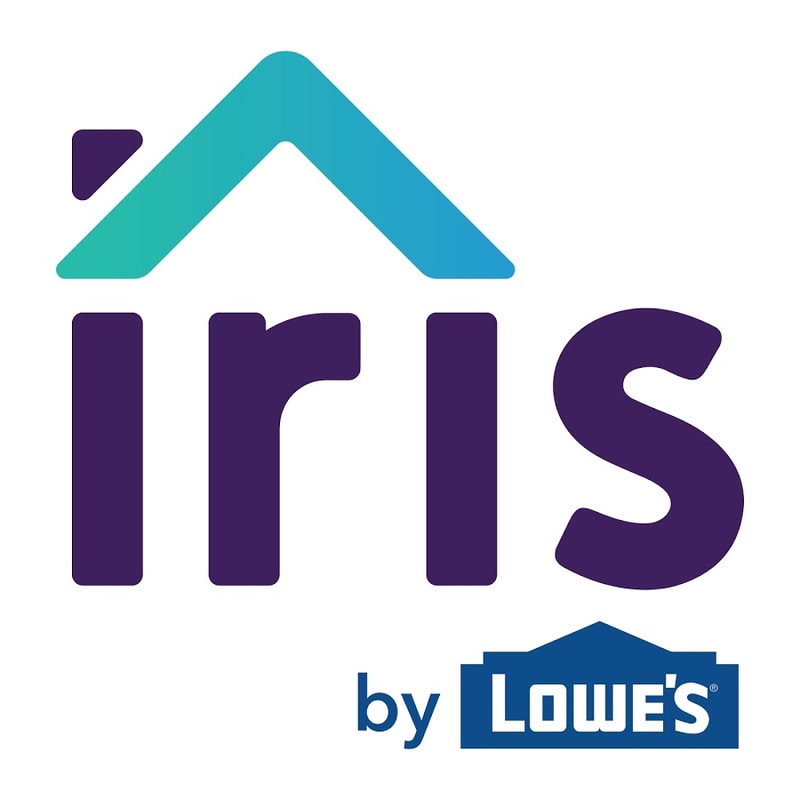 The fact that Lowe’s makes some of the best smart hubs around in no longer a secret, and when it comes to home automation, the first generation Iris Smart Hub, which is available on pretty much every Lowe’s store countrywide, is considered one of the marvels of the 21st century. But now, they've also unleashed the 2nd generation Iris Smart Hub! Measuring 1.3 by 4.2 by 5.5 inches (HWD) with a white finished, the 2nd generation Iris Smart Hub by Lowe’s, like its predecessors, controls numerous Iris-branded and third-party devices. Its circuitry supports Amazon Alexa voice commands, as well as ZigBee, and Z-Wave smart home products. The Iris Smart Hub is equipped with an Ethernet port and two USB ports on the back. You’ll also find a power jack and reset button on the back. On the front, three LED buttons are the main highlight. When everything is working well, the buttons glow solid green. Flush green indicates that pairing is successful; flush yellow indicates that the hub is working on battery power, and flush red is a sign that there is no internet connection. At purchase, you’ll get the four AAA size batteries free of charge. The battery compartment is located at the base and holds four AAA size batteries which serve as a backup should you lose power for any reason. Additionally, unlike those two, the Iris Smart Hub by Lowe’s supports a wider range of third-party devices including but not limited to garage door openers, smoke/carbon monoxide detectors, door locks, thermostats, lighting components, and various sensors. One downside, however, in order to create "Rules and Scenes" that allows Iris components to work with each other, you must subscribe to the Hub’s premium plan priced at $9.99 per month. Additionally, the hub doesn’t support IFTTT recipes. If you want any event triggering, you must subscribe to the premium plan. The premium plan also offers several other features. This includes the ability to add a list of up to 6 people that can receive security notifications. However, one of the most attractive features of the Iris Smart Hub is the ability to receive notifications when a loved one's routine is disturbed. If you have a family member that requires some extra supervision, receiving a notification of any change in routine can make all the difference in the world. Moreover, the premium plan also offers the exclusive Alarm Tracker™. This system brings you a real-time visualization of any alarm that's triggered in your home. Once triggered, you can follow all progress through the emergency dispatch as it happens on your app. Moreover, with the premium plan, you also get the view an enhanced history log of 14 days. 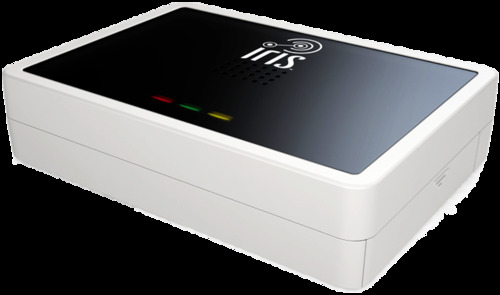 Monitoring for the Iris Smart Hub offers 24/7 monitoring for burglaries, smoke, fire, and carbon monoxide protection for $14.95 per month and includes a 4G cellular backup service. The Iris app is downloadable on both Android and Apple iStore and is very easy to navigate. When you open it, you’ll be taken to the Dashboard where you can view a history of events for each sensor. You can also tap the Favorites bar to view frequently used devices. The dashboard uses special sections called Cards to group components into categories. So, for example, there are special cards for Lights & Switches, Climate, Security Alarm, Cameras, Doors & Locks, Lawn & Garden, Home & Family, and more. Below each card, you’ll find a brief status of installed components in that category. For more details, tap on a given card. A page will be opened displaying each installed component in that category and its current status. Tap any device from the list to find further details such as the last time that specific device was opened, the temperature, battery level, as well as to change settings on the device. 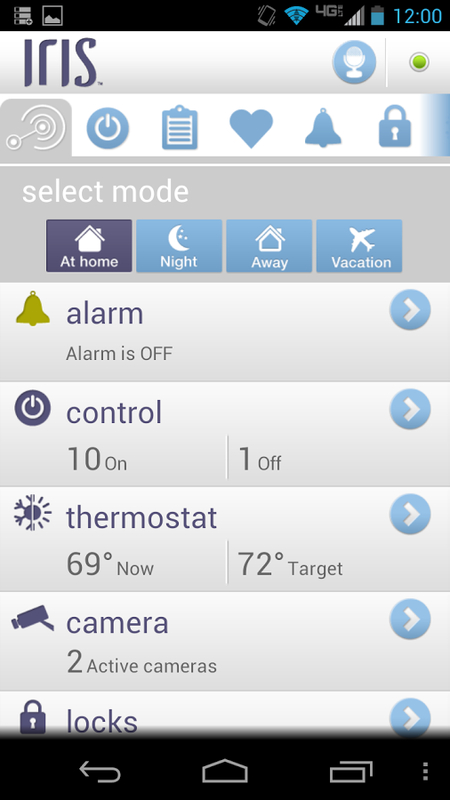 For example, tapping the alarm icon arms or disarms the system. If no one is home, you can tap the ON setting to arm all sensors. If you’re at home but busy upstairs, you can set it to Partial so that only contact sensors are armed while motion sensors are disarmed. And on a normal day, with everyone home, you can set it to OFF so that the system is completely disarmed. To add devices, go to the Dashboard and tap the plus icon. You’ll be taken to the Add page where you can add whichever devices you like and even create Rules and Scenes to control how these devices can connect to and automate components. For instance, after adding a new camera, you can create a Rule to have the camera start recording when the sensor is opened. To edit existing Rules and Scenes, tap the triple bar icon at the upper left corner of the Dashboard. It’s that easy! Even if you’re starting from scratch, installing Iris is pretty simple. Begin by downloading the Iris Smart Hub app and create an account. You’ll need your email address and a password for this step. Then, complete the “About You” portion where you provide some personal information, and you're almost there. asked to provide your full name, phone number, and an optional picture. The phone number will be used in case the fire alarm is triggered. With that done, proceed to complete the “About Your Home” section which asks for your address. As you complete the signup process, you’ll also be asked to provide your Pin Code as well as credit card information. The app then takes you through the hub installation process.You can even watch a step-by-step installation video by tapping the “I Have a Hub” icon on the app. At some point, you’ll be asked to enter your Hub ID found on the bottom of the hub. After entering this ID, it takes about three minutes for the app to find your hub. Then, enter the name of the hub, and with that, you’re ready to begin adding devices!